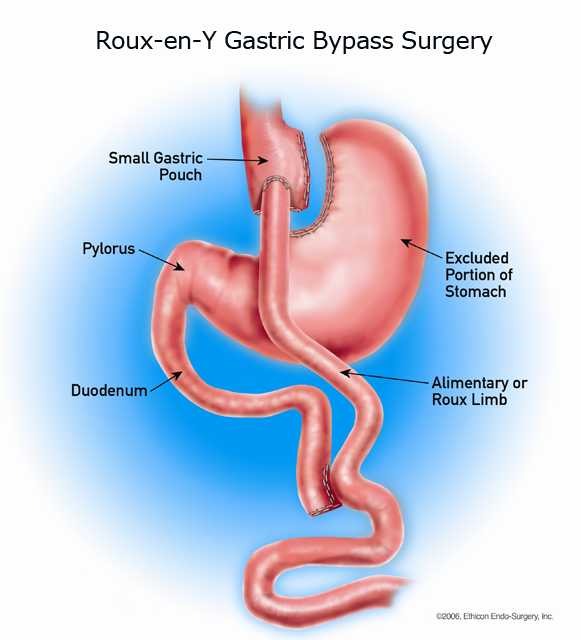 Roux-en-Y gastric bypass is a procedure that alters the path food takes in the digestive tract, effectively preventing the body from absorbing a large amount of calories. The procedure involves stapling off a section of the lower stomach to reduce its size and ability to absorb calories. Then, the small intestine is divided into an upper portion and a lower portion. The lower portion of the intestine is connected to the stomach to allow bile and pancreatic fluid to enter the stomach for digestion. The upper portion is reconnected to a lower area of the smaller intestine, creating a Y-like shape. The procedure takes approximately four hours and is performed laparoscopically for a quick recovery time with very little scarring. Laparoscopic gastric bypass is a relatively safe procedure that allows individuals suffering from obesity and related health problems to have a new, healthier lease on life. The most important benefit of laparoscopic gastric bypass surgery is dramatic weight loss. Patients lose an average of 10 pounds each month after undergoing gastric bypass surgery. With the help of our Successful Solutions weight-loss program, patients can lose more than 75 percent of their excess body weight within one year of their operation. Patients can also enjoy increased mobility and a drastic reduction in their risk for developing serious health conditions that are associated with morbid obesity, such as type 2 diabetes, hypertension, heart disease, high cholesterol, and cancer. In addition, because the procedure is performed laparoscopically, patients can benefit from a shorter recovery time and minimal visible scarring.